Size:S Bust:96cm/37.8" Shoulder:42cm/16.5" Length:63cm/24.8" Sleeve:55cm/21.7"
Size:M Bust:100cm/39.4" Shoulder:43.5cm/17.1" Length:65cm/25.6" Sleeve:56cm/22.0"
Size:L Bust:104cm/41.0" Shoulder:45cm/17.7" Length:67cm/26.4" Sleeve:57cm/22.4"
Size:XL Bust:108cm/42.5" Shoulder:46.5cm/18.3" Length:69cm/27.2" Sleeve:58cm/22.8"
Size:XXL Bust:112cm/44.1" Shoulder:48cm/18.9" Length:71cm/28.0" Sleeve:59cm/23.2"
★NOTE:Please choose 1 or 2 larger size for the item,Such as: US size:M should choose our size L or XL,because the Asian size always smaller than the European and American size. and see our " Product Description" size chart. Occasion: Great for casual, sports, outdoor journey, travel, daily wear or just relaxing etc. Material: High quality and good material. 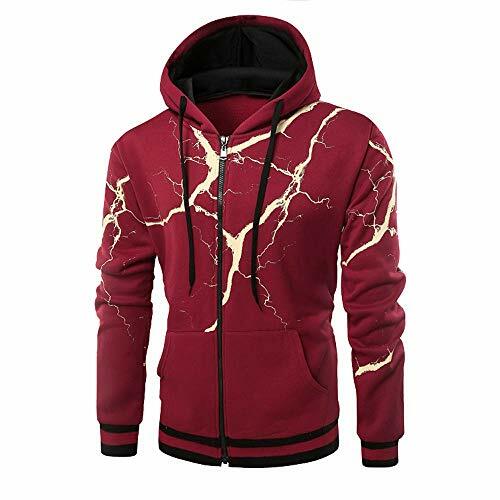 Polyester hooded sweatshirts make you feel soft and comfortable, machine or hand washable, won't fade after washing. After-sale service: If you are not satisfied, please feel free to contact us via email. We will response back within 24 hours. If you have any questions about this product by Sinzelimin Men's Top, contact us by completing and submitting the form below. If you are looking for a specif part number, please include it with your message.